If you ever considered a cruise vacation you will not be disappointed by choosing one that has San Juan, Puerto Rico as one of the ports of call. San Juan is a fascinating mixture of the old and the new. Puerto Rico offers white sandy beaches, cobblestone streets, colonial forts and buildings, museums, vibrant hotels, casinos, restaurants and shops. The island is rich in history, blessed by nature, and alive with its own unique culture. The Port of San Juan is the busiest in the Caribbean, and is ranked among the top 17 of the world's ports in terms of container movement. 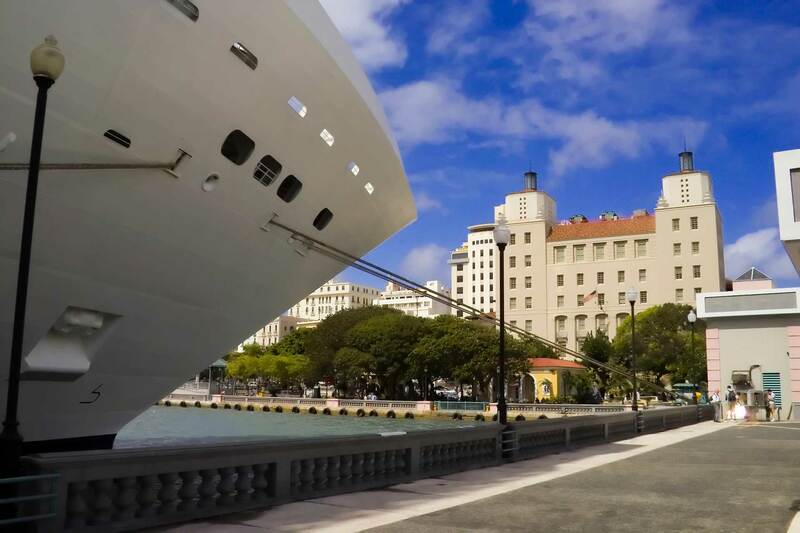 San Juan's two cruise terminals are located a stone's throw away from one another, one in the San Juan Bay and the other at the Pan American terminal just across the bay. Although U.S. territories does not require a passport for U.S. citizens, you'll still need your passport for cruises that stop at ports in South America, Europe, Asia, Africa, Australia and Antarctica. Additionally, U.S. citizens who travel by air to the Caribbean, Canada, Mexico and Bermuda to catch their ship must have a passport. However, if you are cruising to and from the Caribbean, Bermuda, Mexico, and Canada from a U.S. port you do not need a passport - this is deemed a "closed loop" voyage. The majority of cruises visiting Puerto Rico are 3-7 days long, and in most cases you only have a day to enjoy the island. Check your cruise tour inteneries for specials on excursions, tours and activities. Most of the tours are 2-4 hours in lenght and they're all going to the same places across all cruise lines. So, here is the must-see and do list for the one-day visitor - especially first timers. Spend your day walking around the historic walls and forts of the Old San Juan. Popular attractions include El Morro fort, the Quincentennial Square, San Jose Church, San Juan Cathedral, Cristo Chapel, and La Fortaleza, among many others. Tip: There's a free trolley that will take you around Old San Juan and to the forts. Hike the trails of the El Yunque, located in Luquillo, is the only tropical forest in the United States National Forest System. Located about 45 minutes from San Juan. Visit nearby Condado and Isla Verde beaches, located a 10 minutes drive from the pier. You can also visit the Luquillo Beach, near El Yunque. Sample local dishes like lechon asado, mofongo, sancocho and tostones. The largest rum distillery in the world, processing some 100,000 gallons daily. Visitors may tour the plant, the tour will take you through special exhibits explaining the fermentation, distilling and bottling processes, a small museum exhibits Bacardi's history and a free rum cocktail. The following cruise lines offer cruise packages with San Juan, Puerto Rico as one of their ports of destination. This company includes Mayagüez, on Puerto Rico's west coast, on its itineraries departing from Fort Lauderdale and Tampa. Inteneraries include San Juan on cruises departing from Fort Lauderdale and New York. Search for the latest Cruise Deals.